Pakistan, with the second largest Muslim population in the world, is a crucial country in the international system. It is an ally of the United States in the global `war on terror' but is also regarded as a major bastion of some of the most active jihadist organisations. This book highlights and explores the paradoxes that characterise contemporary Pakistan from the simultaneous democratization and Islamization of civil society to the schizophrenic US-Pakistan relationship. 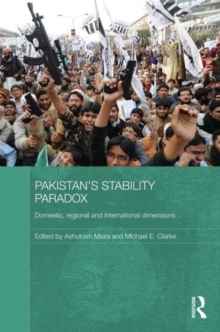 The central theme of the book looks at Pakistan's stability paradox. Commentators and analysts have over recent years often suggested that Pakistan was on the verge of state `failure' or collapse resulting from a myriad of dilemmas. Yet, remarkably the Pakistani state has proven to be more resilient. This book identifies not only the factors that are contributing to Pakistan's perceived instability but also those factors that have contributed to the state's resilience. Chapters explore this central paradox through three core dimensions of Pakistan's contemporary dilemmas - the domestic, regional and international dimensions.